Don’t just settle for a rubbish bin, take your pick of the very smartest designs available. 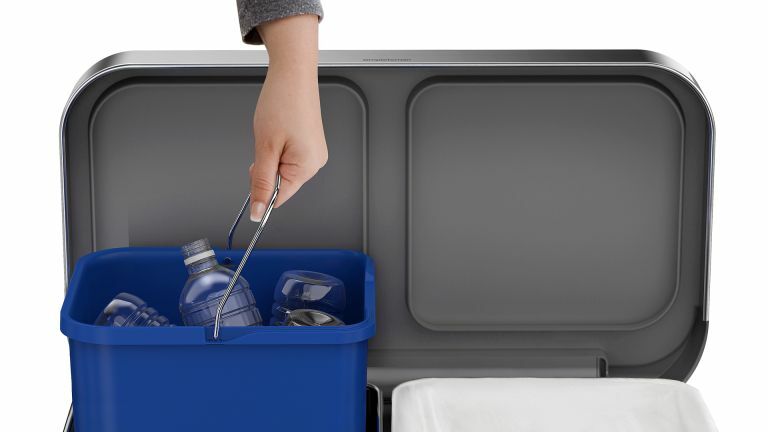 Whether you're recycling, chucking out trash or even compacting it, we have a stylish solution for you. Yes, you can buy plastic bins from Tesco for a few quid, but if you do that nobody will respect you. Deal with it. What is the best 'garbage pail'? For me, as a connoisseur of trash, my favourite home dumpster is the admittedly pricey Joseph Joseph Titan Compactor. Thanks to its innovative compression system there will be fewer arguments over who should take out the bins out, and more room in landfill for all of us. Hoorah! If you've only got £10 you can find a whole selection of cheap kitchen bins capable of holding onto a bin liner, but be prepared for flimsy flip lids and gunk collecting hinges. Sure, they'll work, but if, like 'First Husband' Philip May, taking out the bins is one of your 'jobs' you deserve a little bit more. If you're a family of four, choose the largest capacity bin you can fit in the kitchen: at least 30 litres. For smaller kitchens and flats, a 20 litre design should suffice. The ideal bin should give the give the longest possible time between emptyings, but without taking so long to fill that everything rots and stinks out your home. Of course, much rubbish these days is recycled, and for that you need a bin with at least one container. Recycling takes up a huge amount of space, and while multi-compartment bins offer a seamless solution, expect to be emptying them regularly. You're better off sacrificing some cupboard space and choosing an inexpensive built-in recycling solution – try Ikea.com – that can hide all the bottles from the neighbours until the bin men arrive. As for freestanding designs, it's worth choosing models with removable inner compartments – usually plastic – that make it easier to remove a full bin liner without tearing it. Charcoal filters are some help for absorbing nasty odours, which can be a godsend in the summer, but don't rely on them too much. Finally, make sure your bin can be cleaned properly. Stainless steel and plastic are both hygienic materials, but look for easily removable parts and minimal joins, where foul bin juice can fester. It's quite costly, as bins go, but no other kitchen trash can comes close in terms innovation. As well as its fingerprint-resistant, stainless steel construction and stress-tested foot pedal, the standout feature here is its hygienic trash compactor mechanism that means you can maximize the amount of rubbish in each bin liner, and reduce the number of times it needs emptying. Once the bin is opened via the foot pedal, you chuck the rubbish in and then lift the top handle to vertical and push down into the bin. Yes, yes, we wanted it to be automatic as well, but the action is extremely satisfying, especially as you don’t have to encounter any gunky old stuff, as it's all sealed within the bin liner. Joseph Joseph estimate that you can get three times as much rubbish in one bin liner, and while it does depend on the rigidity of what you're throwing away, the results were fantastic. We were worried that having loads of rubbish lingering about would just make the kitchen smell, but the well sealed lid and replaceable charcoal filter help keep things fresh. Featuring a 24 litre pull-out bin and separate 34 litre internal compartment, this 56cm wide stainless steel design is the most spacious twin compartment recycling bin on the market. The steel pedal has been engineered to last more than 20 steps per day for 20 years, the innovative internal hinge won't bash on the kitchen wall, and inside there's a pouch for storing spare bin-liners – it works like a packet of wet-wipes – that's beautifully simple and saves time and faff. The look may not exactly be elegant, but the stainless steel is hard to fault and easy to clean, helped in no small part by a finger print resistant nano-silver coating that's also resistant to germs. Be warned, though: this bin is a monster. While practical, especially for hiding the recycling, you'll need a huge kitchen for it not to dominate the space. The utility room might be a better home for it. Another premium bin from Joseph Joseph, the Intelligent Waste Separation and Recycling Totem – to give it its full title – boasts one massive compartment and one smaller, pull-out drawer with an optional divider to make it into two smaller compartments. I actually ended up using this for storage of sponges, dishcloths and the like, but you could use it as an on-the-small-side recycling area. The main bin is easy to fit and remove bin bags to/from, and has a charcoal filter and well-sealed lid to reduce odours, or at least keep them within the bin. Another solution to smells is provided by the inclusion of a small composting box, which is stored at the top of the bin and can be filled and emptied of food waste much more regularly, while the larger compartment fills up with non-rotting rubbish. The powder-coated steel body is great, although the polished steel lid is a bit of a smear magnet. I'd say this is great for couples who generate a lot of waste but possibly just that bit too small for a family of four or more. HELLO, Spaceboy. Wesco bins always look the absolute business, and while the price of even its smallest pedal bin pushes the £100 mark, they're built exceptionally tough, and should last for decades. And, if you hadn't noticed, the Spaceboy XL looks like a 1950's cartoon rocket. It doesn’t do anything fancy – no sensors, compactors or odour filters here – but it's made from thick rolled steel, has an equally robust steel insert bin, for easier emptying, and unlike any other bin on the market, if a part breaks – the sprung hinge, bin-liner band or recessed handle – you can buy replacements. The removable plastic inner bucket and stainless steel lid unit reduces the amount of wrestling required when changing the bin liner. This classic cylinder pedal bin from Brabantia comes in a choice of 16 colours including the suitably on-trend Moss Green and Metallic Mint. Offering endless amusement for toddlers, and reduced cleaning for grown-ups, touch-free bins like the Sensé are great if your hands are so full of rubbish, operating the usual lid-opening mechanisms is difficult. That's particularly handy if you've got raw meat all over your hands and you're trying to chuck some cooking waste away. Just wave your e coli-infested mitts over the bin and wait for the magic to happen. The lid also closes automatically after five seconds of inactivity, or you can keep it open or close it manually, via a button. Made.com's is the best of this breed, with seven attractive finishes including blue, chrome, white and black, and a very attractive price. The quality of steel used is not as good as on the pricier bins here but, interestingly, when the one I had started to rust, Made.com replaced it, no questions asked, without me even mentioning I'm a journalist.